Whilst stripping my project engine fc550 2002 I found this is at simple fix of new seal ? You may need a new seal or head gasket, etc..
What's the rest look like? and the combo Bearing / Seal on the inside of the cover. Its easy to nick the seal upon side cover reinstallation. KTM sells a plastic cone protector or use some tape on the balancer shaft. another alternative is to use a small, fine file and slightly round off the sharp edge of the shaft that cuts the seal. 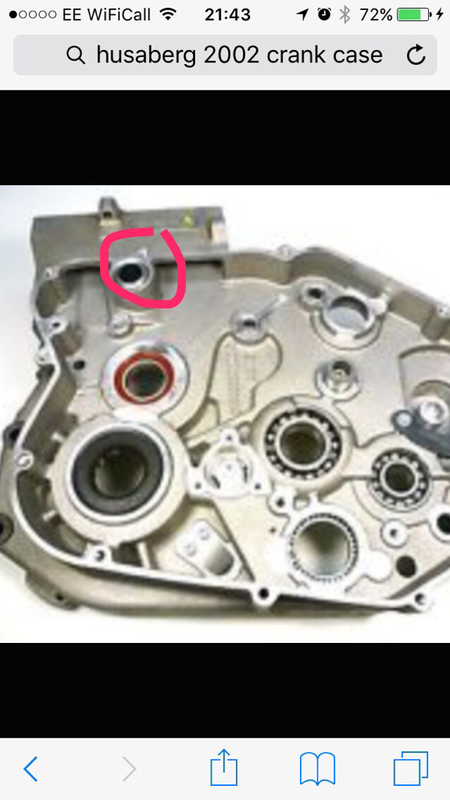 should there be an oring where the water gallery comes out the crankcase and meets the clutch case ? A o-ring is on the balancer shaft AKA The Water Pump Shaft. When sourcing the o-ring in the parts book look at the balancer shaft diagram not the water pump diagram. Purchase a few of them as they are not easily sourced from aftermarket suppliers (your local auto parts store). The part with red ring should there be an o ring here ? Yes. It usually stays in the side cover and then falls out on the floor somewhere.